1 d Penny Black stamp lettered K-J, identified as coming from plate 5 using Guide Lines to the Penny Black by P C Litchfield. Period of use: Earliest issue dated 16 June, 1840, with prints made between 8th June - 30th December, 1840 and again briefly between 22nd January and 5th February, 1841, when a provisional black printing was made. Plate then used for the printing of the 1d Penny Red. Cancellation: Clear Maltese Cross cancellation in red ink. Traces of horizontal guideline in the letter squares and through the value "One Penny" (very common on this plate). Right sideline extends slightly below. What an excellent site. I just stumbled onto it tonight. 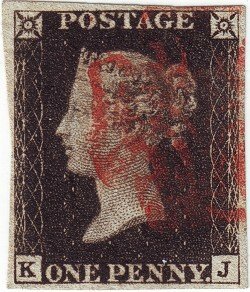 I have been collecting for 50 plus years and specialize in penny red and a few penny black. Thank you.